NEM is revolutionizing the veneer installation process with their new interlocking veneer panels. 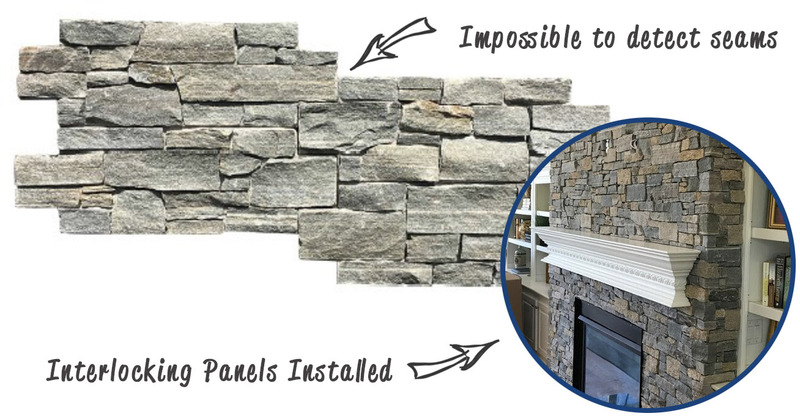 These panels can be installed in seconds, compared to 10x the time it takes to lay loose individual veneer stone pieces. 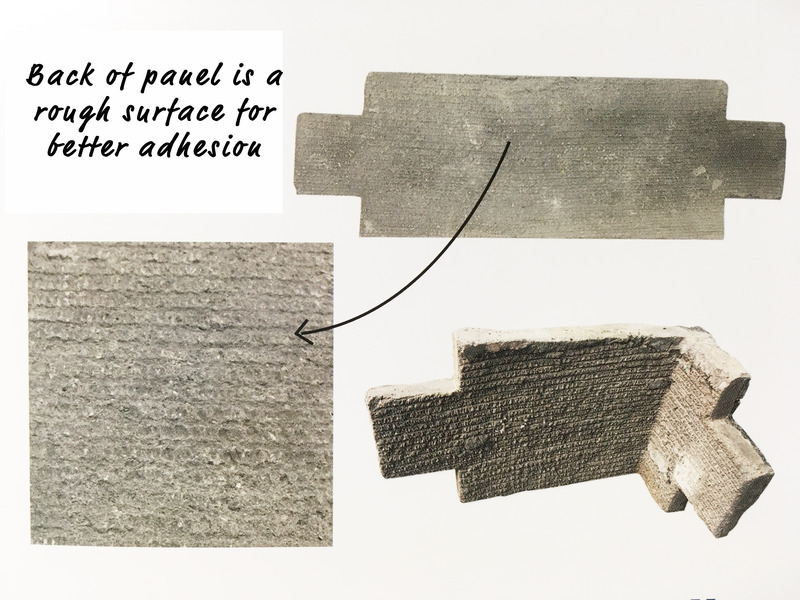 What makes these panels different from tradition veneer panels is their staggered shape which makes it nearly impossible to detect seams. The classic elegance and intricate detail of small stones combined with the simplicity of a panel system allows this paneling system to mimic the appearance of a precision hand-laid dry-stack veneer stone. Easy to use, no specialist skills required. 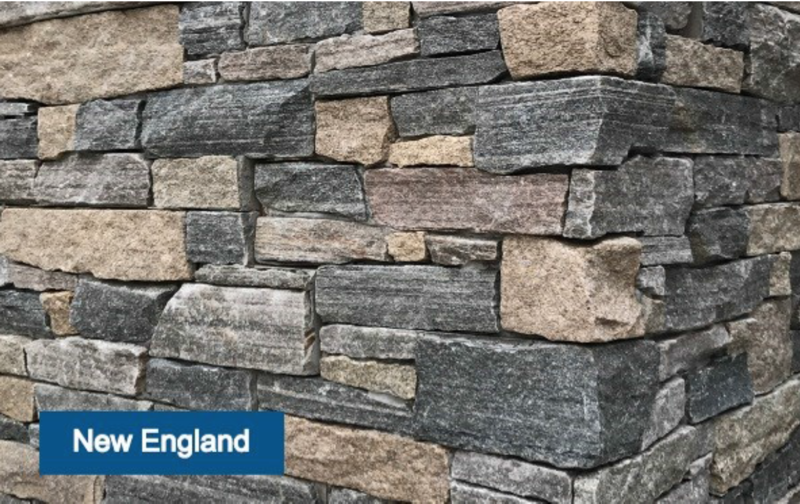 NEM Interlocking Panels come in the ever popular ledge stone cut in the colors New England Blend or Berkshire. Calculate the square footage of the area. Interlocking Veneer Panels come in corner pieces and flat pieces. Linear footage is used to calculate corner pieces and square footage is used to calculate flat pieces. To figure out the square footage simply multiply length by height. 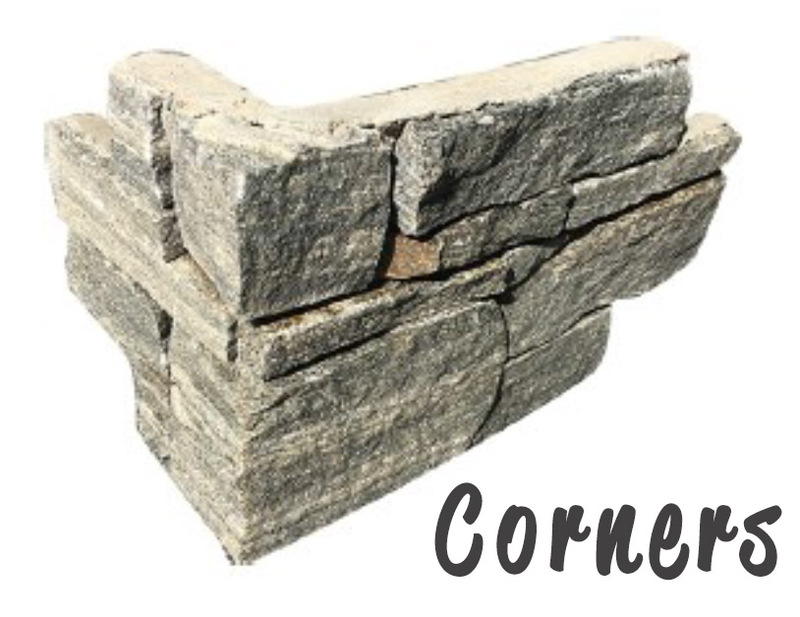 To calculate the liner footage for corners simply measure the height of all walls and add together. *Tip: Be sure to subtract the areas filled by doors, windows, and fireplace openings. Prepare the surface area by making sure that the existing surface is sound and level (i.e. repair cracks). 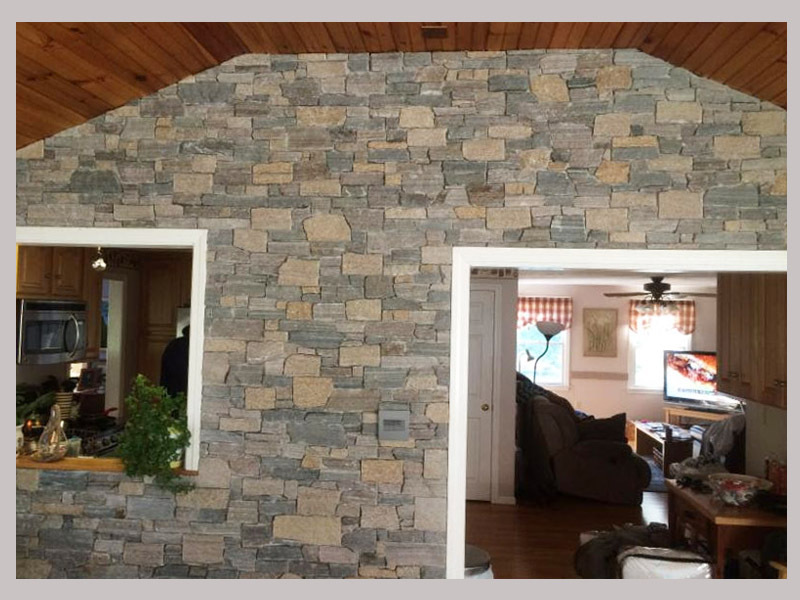 Interior and exterior applications may require different preparations for the stone veneer. If you are unsure about your existing surface area please contact a representative at TLC Supply. Making a mock-up pattern on the floor because applying the stone to the wall is usually recommended. Make sure that panels are fitted together at random so a repeating pattern isn’t created. It is helpful to start with the corner pieces and then fill the inside. Once you have laid out the corners start at the bottom with the Starter Panels. These panels are 1/2 height and are used on the first course of an installation. Starter Panels will give you the offset you need for the rest of the area. *Tip: Instead of cutting a full size panel in half and potentially wasting product, use the Starter Panels to save time and money. Pieces may need to be cut to lay flush against the floorboard, ceiling, or fireplace opening. You may cut the pieces with a wet saw using a carbide or diamond tip blade. 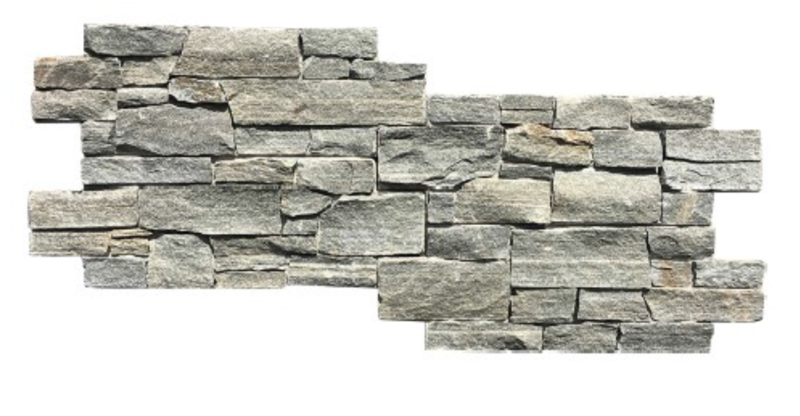 Be sure to wear protective eyewear and follow proper safety measures when cutting stone veneer. Run a horizontal chalk line every 18 inches for a reference point to help keep your courses level. Dampen the wall to increase the bonding strength of the mortar. Spread approximately ½ inch of polymer modified mortar such as Ardex X5 to the back of the stones (make sure there is 100% coverage) with a 1/4” mason’s trowel or notched towel. Apply the stone to the wall with firm pressure and wiggle it gently to make sure the mortar is evenly coated. Hold the stone in place for a few seconds to ensure a secure bond. If the mortar seeps out you may use a damp cloth or sponge to wipe it away. The beauty of having the panels already fixed to a precast backing is that there is no need to fill mortar joints. This eliminates the step of needing more than one type of mortar to fill the joints. If mortar gets on the panels you may use a gentle cleaner such as Simple Green to remove it. If the application is outside you may wish to seal it to help prevent water damage and stains. We highly recommend a breathable siloxane/silane blend sealer. Keep in mind that not all sealers are created equal, to learn more about sealers please visit our blog post on sealers. 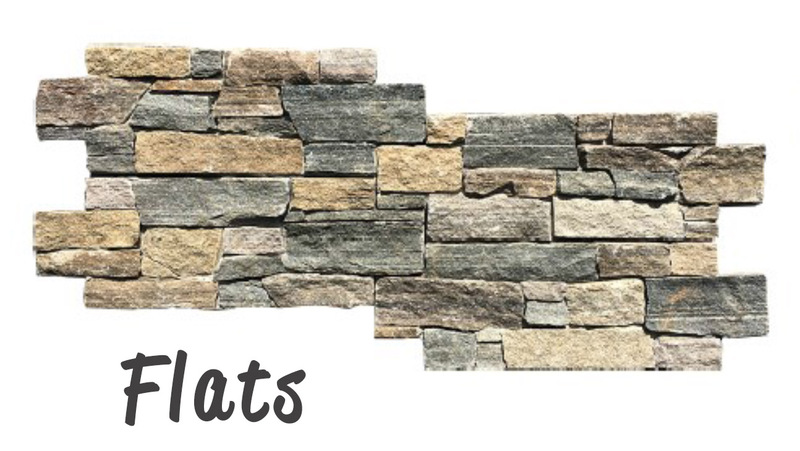 Different types of stone react differently to different types of sealers so it is important to select the proper one. Since these interlocking veneer panels contain granite we recommend using Prosoco Stone, Masonry, and Tile Protector to seal them. You can find Interlocking Veneer Panels as well as other types of natural thin veneer stone at TLC Supply in Quincy, MA. 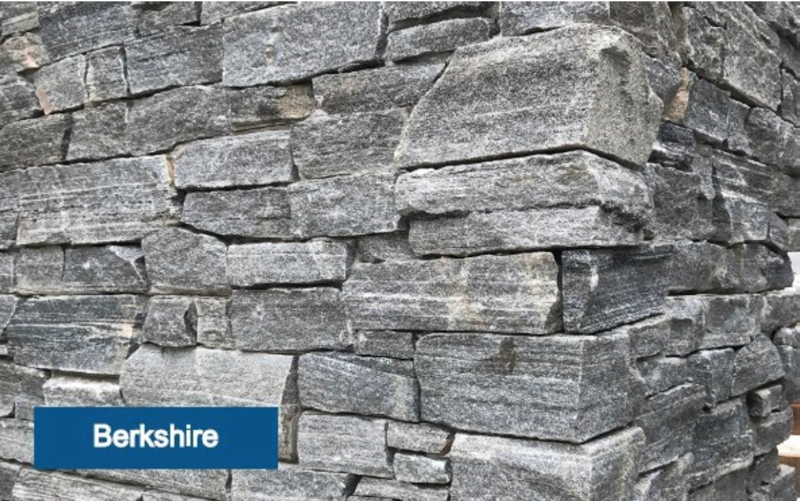 Please visit our website to see even more hardscape and masonry products ranging from bluestone,granite,brick,natural stone,block,sand,cement, and much more! The experts at TLC Supply are happy to answer any of your project questions, just give us a shout!